Topping out at a little over 600m between Fan-y-Big and Cribyn the Bwlch-ar-y-Fan pass or the Gap is a true mountain biking classic. It is days out, like this, that fuel my passionate love of riding bikes away from tarmac and avoiding little black or red arrows of trail centres! A couple of Peroni’s to the good and restoring the fuel tanks to full with a hearty lasagne in the banked garden of the Farmers Arms in Cwmdu and the chatter amongst us was all about reliving the best sections of the W2 trail at Afan. Traipse down the M4 – check. Flow, high-fives, 50p shower – check. Negotiate the tight lanes of the Beacons to find the over night campsite, source watering hole and grub – check. Spend the rest of the afternoon and evening in a glow of excitement about the ‘what was’ and the ‘what will be’ – check. All you need for the perfect MTB weekender and something I simply cannot get enough of! So the ‘What Will Be’! Now don’t get me wrong, I love trail centres, but this weekend was all about sharing a MTB adventure with two friends who wanted to ramp up their biking to new levels. Using my vast experience of these types of trips, my aim was simple. 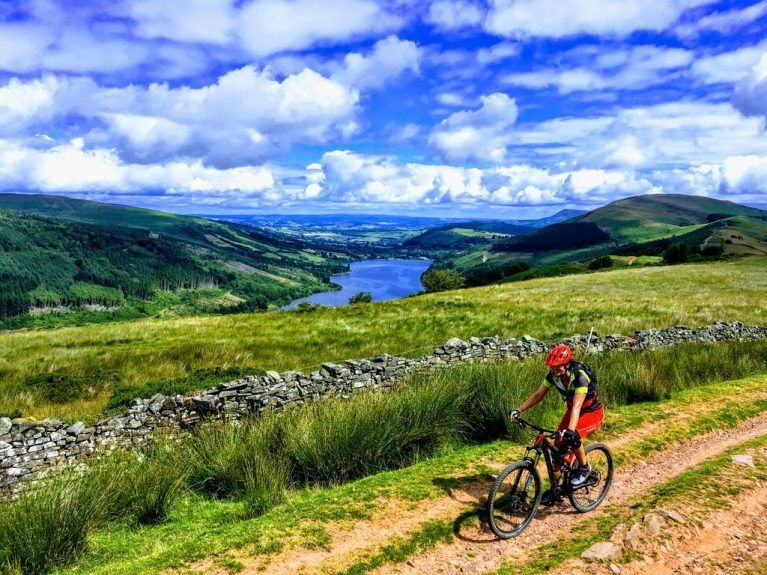 Warm-up and break them in easy with a trail-centre-tear-up, before taking on a true and proper mountain biking day out on the Brecon Beacons. At breakfast, I was buzzing! This is me in my element and time for a big biking adventure. Simply, bring it on! In the meantime, Alison and Andy really had no idea how to feel or what to really expect, despite my many enthusiastic attempts of painting an accurate picture. It was not long before the Talybont reservoir was on show between sporadic relief in the trees to help the eyes feast, as we clambered our way up the cobbled trail from the vans. The big beaming blue sky certainly encouraged the legs to wake from their slightly heavy slumber as we winched ever closer to the top. Free of the woodland, the trail turns into classic UK bridleway. Leaving the reservoir trailing behind, the perfect gradient lures our four bikes around and up the contours just as the first of many open and rugged vistas dominates the view. Taking a little breather after the lung busting yank up the steep and technical kicker of Pen Bwlch Glasgwn (Blue Valley Pass), it’s easy to see why spirits are high. Not just the views and the feel good factor of chalking off the first climb but we have been joined by Paul ‘Cookie Monster’ Mulley who is a friend of mine from Brighton. Recently moved down to South Wales, Paul with his infectious grin and endless stories of guiding hapless tourists in Greece is bouncing and creating the perfect conveyor of chuckling between the gang. Taking aim between the ruts, the bridleway begins to bring a little reward as we turn up the wick across the open moorland. Finally we are freewheeling and taking in dinky hips and features that festoon the trail as it meanders towards the ford. With the shins drenched, the gate open, we roll on down through Cwm Callan. The forest double track certainly has some lovely loose, techie sections that provide a jagged edge in places for the tyres and the adrenaline to perfectly sit on. Spat out at the Pentwyn Reservoir and everyone in check, the tyres get a feel for the tacky tarmac in the rare Welsh sun. This is it, the last short section of plain sailing before we start the ascent up to the Gap. Wedging the gate open and allowing our little convoy to keep rolling, sees the smiles simmer off and replaced with a steady shift for the legs to see through to the top. Once again, mountain biking perfection all within a climb. Long, random, all-encompassing salivating views and the perfect gradient that provides enough of a burn for the rewarding scoff-fest at the top. One-by-one we reach the eroded doorway plateau of the Gap. Hikers scurrying around and flanking us on both footpaths down from Fan-y-Big and Cribyn like ants as they seek-out the perfect rock to sit on and rest their flasks. Ensuring my mob of merry bikers did not slip to close to the actual Gap, as I wanted to keep the big reveal all to myself whilst we enjoyed the scotch eggs and samosas. They didn’t seem too bothered or that curious and to be honest I do not think any of them had an idea of what beauty would bare itself down and through the Gap. It was all a case of reliving the ride so far and big high-fives between Andy and Paul to rubber stamp the effort and the reward of reaching the perfect lunch stop. Nervously keeping conversation with Andy and Alison flowing, I was marshalling the itchy Cookie Monster to ensure I was the first one down through the Gap. Not for any selfish reasons, oh ok, I wanted to see their reactions first hand and up close as they met me on the almost perfect look-out point. First, Paul,”wow”. Alison up next, “OMG”. Andy rolls up…”F**k me”! Both Alison and Andy are used to big mountain country from their snowboarding and back country Alpine adventures. Ok, we were lucky with the weather on this day, but this was the very reason I was like an anxious steward during the lunch break. The big reveal that is hidden so well, had delivered. All three just abandoned their bikes on the grassy look-out and just stood in awe and soaked up the vast horseshoe shaped bowl. To this day, their reactions are still the best bit about this ride for me and the Gap is one awesome mountain bike ride! The drum is out again and I’m going to beat it and not apologise for it! You know what I’m going to say, but for me, combine that view with this ancient trail that hugs the western flank and serves up everything you would want from a descent and well, it is exactly what mountain biking was for many and still is the main reason I throw a leg over a bike and always will be. With the crowbar out and prising my three friends away from THAT view, it was time to turn their attentions to the second reason we took on this adventure today. The Gap descent! It looks like a tipper-truck has slithered down a shallow canal and emptied its load of loose rocks and slabs. Unlike canals, the first section has a nice gradient, which is all you need for the fun factor to kick in. A good start and both Paul and I rattle down different lines with our bikes dancing and jinking beneath us. Keeping the momentum honest is the best way to enjoy this part. The bike stays light and floats over the rocks. Being starved of anything that resembles a rock from our home turf back in Sussex, once the rubber is making that noise, well, I’m off, it’s as simple as that! Opening up the Stumpy and putting down the power on the pedally bits ensures the others are left picking their way down the rocky canal. This gives me a chance to get the phone out and capture a photo or two of the three of them wrestling the trail for a good line and in part just holding on and letting the bikes do their thing. Smashing past me, eyes fixed on the distance and clearly focused and ensuring every inch is lapped up, the gang disappear over the undulating trail. I take one last 180° look at the place. No walkers, no bikers just me and the breeze funnelling its way up to where we started. I had 50% of the descent left and despite the gnarr dropping an R or two, this bottom half is so fast. Saddle down and full RAD mode selected, I was seeking maximum speed. Pumping every dip and jumping everything I could set my watering eyes on, this MTB Leader who does not often get to take the shackles off and open the taps was one happy bunny when he hit the bottom. With the adrenaline spiking, the anchors firmly deployed, I jumped off the bike as it was dumped on the grass. “I fookin’ love mountain biking” and a huge man slap of a high 5 with Andy! Using the local lanes and the canal-side Taff Trail we were soon heading back to Talybont via a cold refreshment in the Royal Oak. Hot, sticky and everyone buzzing, the clang of pint glasses brought a simultaneous “awesome”. I knew it already, but these 3 friends now get it!